For many, the term ‘Bread’ reminds us of ‘Sick Days’ and we are mostly introduced to Milk & Wheat variants of Bread that we use in Sandwich. My journey to Germany, introduced me to a world of Breads (Brot) and their mini version called Broetchen (Brötchen). Bread / Brot is one of the significant part of German cuisine. These breads are available across shops / kiosks / restaurants in different varieties – Vollkornbrot (Whole grain bread), Kürbiskernbrot (Pumpkin seed bread), Mehrkornbrot (Multigrain bread), Sonnenblumenkernbrot (Sunflower seed bread) and more! These breads are hard and one might not find it easy or be tempted to try. One does have varied options to eat with these breads like cheese, jams, marmalades, nutella et al. However, there is an easy option to try and they are the mini version called Broetchen. 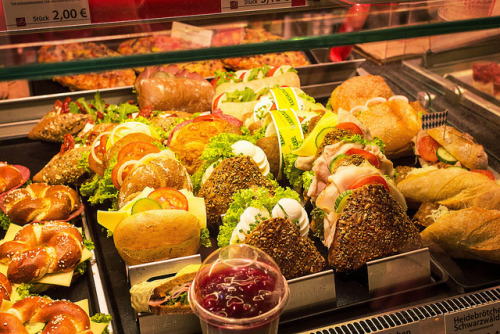 You might find them as Belegte Broetchen in almost every eating outlet – kiosks, restaurants, gas stations et al. And if you are a vegetarian like me, you can always ask for ‘Broetchen ohne fleisch’ (Bread w/o meat) or ‘Nur Vegetarisch’ (only vegetarian) – which usually has cucumber, cheese & lettuce. As part of my regular weekly grocery – Vollkorn / Sonnenblumenkorn bread types find its way to my kitchen and yes that forms part of my ‘healthy’ breakfast! Note: Picture sources are from the internet! Wow Jenz. Such variety! That said, ever since I started baking bread at home, I stopped buying them from the store.